I’m really sorry for constantly tempting you with all these sweet treats. I really want this blog to be an even ratio of sweet treats to healthy dinners – but it just seems that all our dinners lately have been fairly un-blog worthy. Plus the fact that sweet treats just look so much prettier in pictures. At least these have raspberries in them, right? I love raspberries. They are hands down my favorite berry. 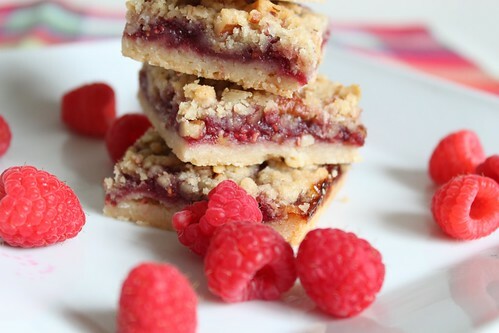 I know it’s not technically raspberry season yet, but as soon as I saw these raspberry bars on Brown Eyed Baker, I had a craving for them. My mother-in-law had given us some similar raspberry bars for Christmas last year, and to be honest I think I finished off the entire tin myself- John may have gotten ahold of one :-). They are delicious. 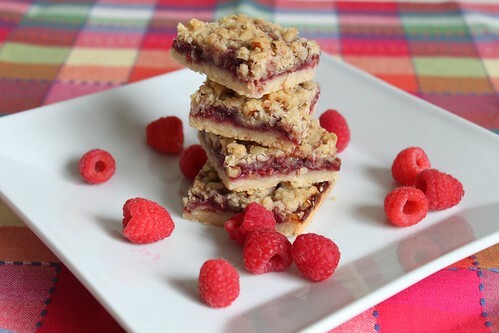 They kind of taste like a raspberry pie, in an easy to eat bar form. When I finally left my dungeon (slash study room) to get groceries, I had my list all planned out to make these, and then the grocery store was completely out of raspberries. Sad day. But never fear, my knight in shining armor picked some up for me at costco. (Now of course I have an over abundance. Not complaining). Yes, that says 10 pounds. 10 pounds of oatmeal. I made 2 full batches of granola and have still barely made a dent in it. I figured these raspberry bars would help use some more of it up – but a 1/2 a cup out of a 10 pound box is really child’s play. So don’t be surprised if you see some more oatmeal using recipes around here. 1. Preheat oven to 375°. Line a 13×9 inch pan with tin foil, overlapping on the edges and spray with cooking spray. 2. Combine flour, sugar and salt in a mixing bowl. Mix on low using a paddle attachment, then add 1 cup of butter, 1 piece at a time. Mix on low until the crust begins to crumble like sand. 3. Reserve 1 1/4 cups of crumb mixture (to be used for topping). Spread the remaining mixture into the bottom of the foil lined pan, and press down to form an even crust. Bake for 14-18 minutes. 4. In the meantime, combine the raspberry preserves, fresh raspberries and lemon juice in a small bowl. Mash with a fork, leaving bits of berries intact. 5. In a separate bowl, mix together oatmeal, brown sugar, crumb mixture and remaining 2 T. of butter. Using your fingers, pinch the mixture until the butter is fully incorporated. 6. Remove baked crust from oven and immediately spread preserve mixture on top. Then crumble the streusel mixture on top of the berries, covering the top. 7. Bake for an additional 25 minutes, or until bubbling. Let cool in pan for about an hour. Let cool completely before slicing. This entry was posted on May 18, 2011 by Spice Is Nice. It was filed under Bar Cookies . These look delicious!!! I like the picture too! !